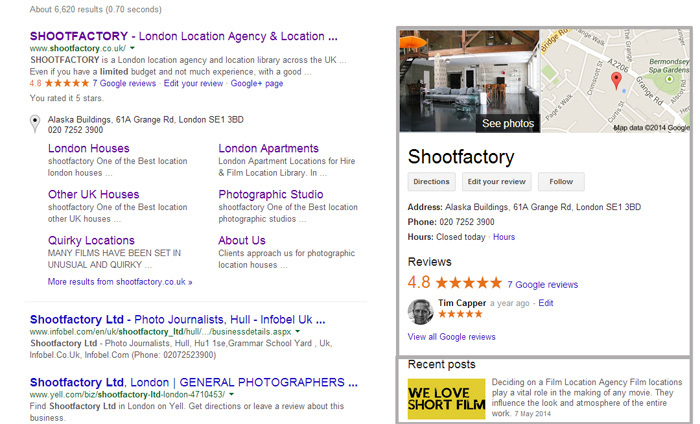 Local businesses can boost their presence on Google+ by following some simple SEO techniques. I have written quite a few SEO for Google+ Business pages prior to this, this article covers a few simple SEO steps to improving your Google+ profile and improving your local business & brand visibility online. There is nothing mystical about SEO, just logical steps to increasing (or optimising) your online visibility. Like your websites pages, you need to have the right content in the right place in order for search engines to return the desired result. I will start with your personal profile. All Google+ Business Pages, Brand, Organisation pages are attached to a personal account, this is because an email registered with Google has to have a name. You dont have to use this, but this is where your Google+ SEO journey begins (remember, logical steps). The first logical step, is to optimise your own Google+ profile. If you become personally active on Google+ and begin using your personal account on Google+, you may as well SEO your personal profile. Fill in your : Tag Line, Introduction, Occupation and Skills. Also fill in Contributor to with the site urls that you intend to contribute to, you will need to add a site here that you would like your author profile to appear in search results. Note : You can add links within the introduction. 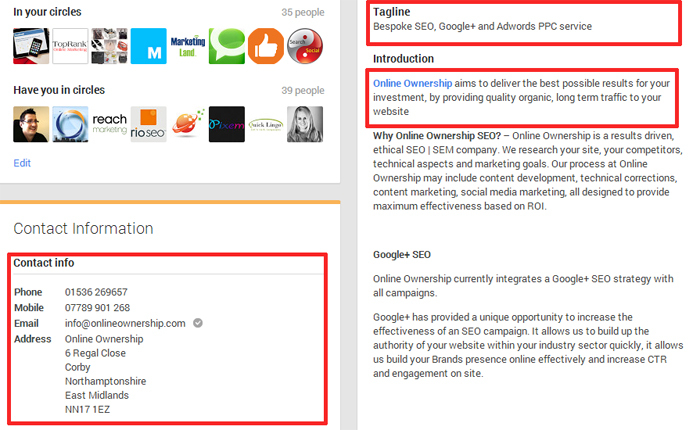 The introduction section of the Google+ Business Profile is where you can add as much information as you require. You can add the main sections of your website, products and add links to these sections. The more information that you provide, enables Google to understand your Google+ Business Page when someone searches for relevant information. Google will display your tag line and some of your introduction text within the search results, upto around 160 characters. YES your Google+ posts do appear in search. This is not FB or Twit >smile<, so make sure you create a good Title and an introduction. Your first 160 characters will be treated as your meta description. Obviously a #caturday post does not need to be optimised, but “important” posts both personal or business page needs a little thought. 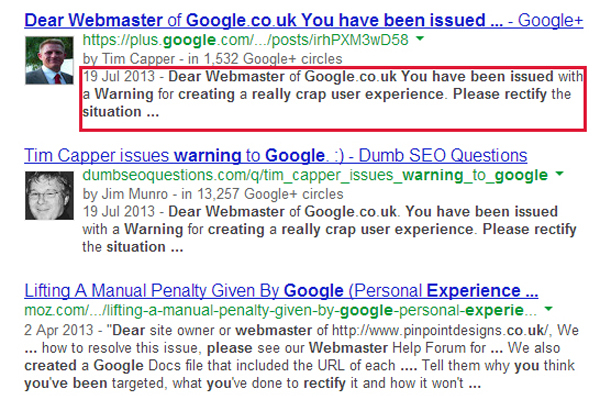 All Google+ Posts do appear in search eventually, they may not appear Page 1, this is another post in itself. 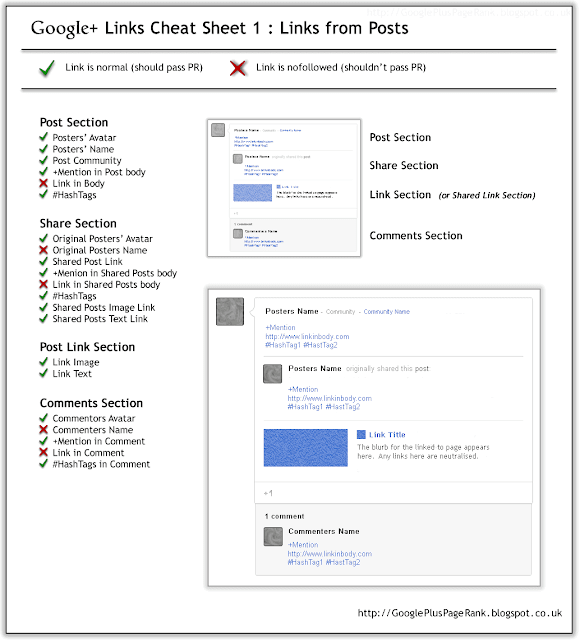 For Google+ posts to appear on Page 1 requires building up authority within Google+. 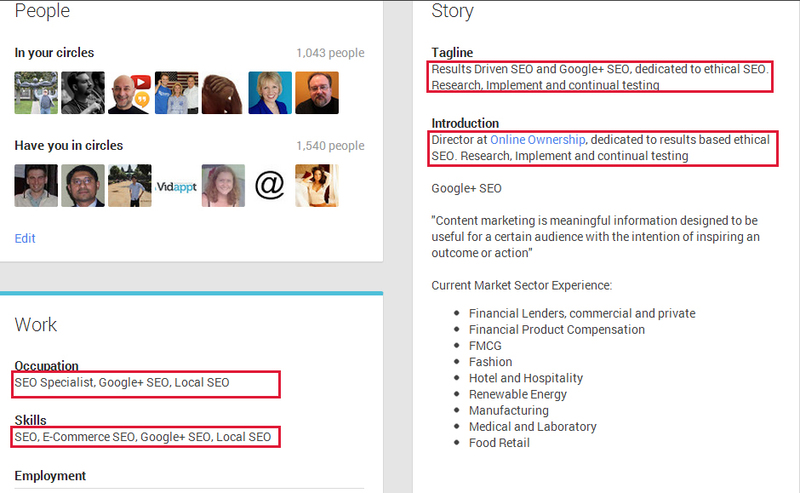 See Lyndon NA ( the Only SEO Googlebot is Afraid of ) cheat sheet on what passes Page Rank within a Google+ Post. By verifying your Google+ Business Page, your site will benefit from having your latest Google+ Business page post appearing within the knowledge infopanel appearing for Branded terms. 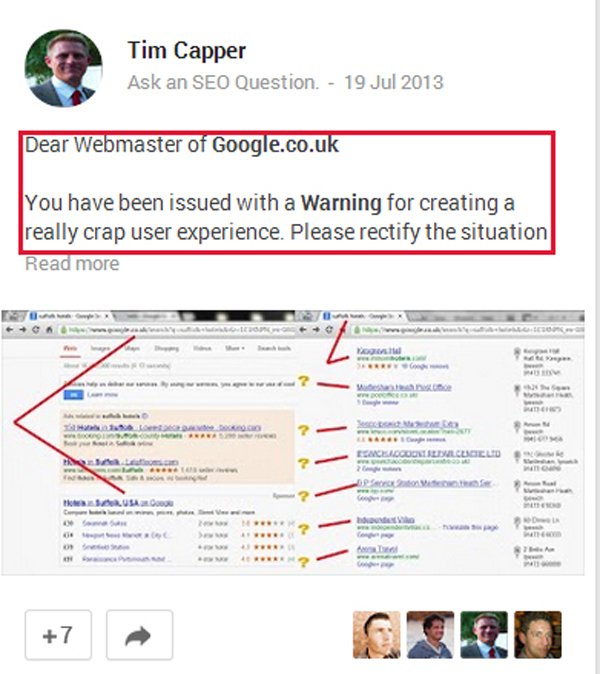 You can connect your site within your Google Webmaster Tools. You can code it into the footer on site.